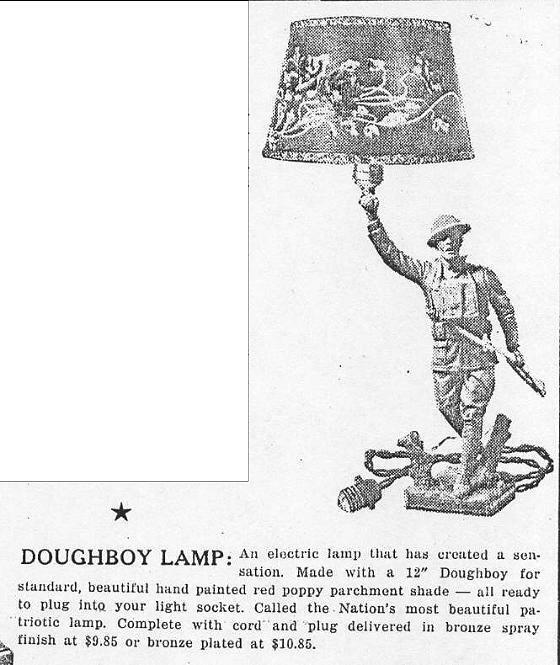 "AN ELECTRIC LAMP THAT HAS CREATED A SENSATION"
"THE American DOUGHBOY Art LAMP"
A variation of the Doughboy statuette was the lamp version, marketed as "The American Doughboy Art Lamp". It was just the 11.5" statuette to which electric lamp hardware had been attached. There were also candlstick and incense burner versions, again modified from the statuette version. These latter modifications are often perceived by sellers as more rare and valuable than the original statuette, but they are often in worse shape (missing more parts) and not worth as much. Plus there is the common misconception that the lamps and other versions are homemade alterations, although some people actually did that to save money; the factory issue lamp originally cost nearly twice as much as the plain statuette, $10.85 vs. $6.00. 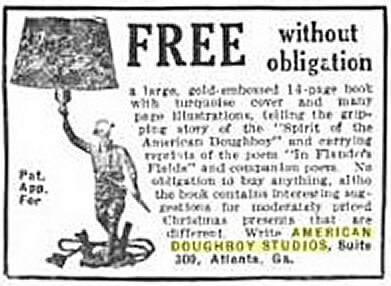 In a slick pamphlet sent to prospective buyers, Viquesney pushed hard to sell the lamp and candlestick versions, particularly to women, whose homes, he tried to convince them, wouldn't be complete without the addition of "the nation's most beautiful patriotic lamp" to their furniture decor. 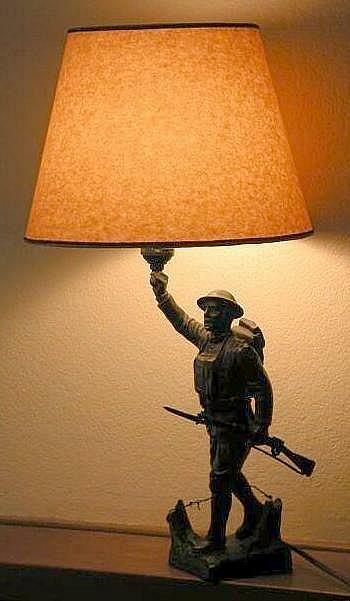 But despite such efforts, Viquesney's Doughboy lamp and other variations never sold as well as the original statuette. Below are some ads for the lamp. Life Magazine, Nov. 2, 1922. Viquesney mostly directed his ads toward ex-servicemen in magazines like The American Legion Weekly, but some ads appeared in newspapers and popular magazines like Life. Click on the thumbnail images above to enlarge.